Lavida is an ultra-premium, highly-responsive and multi-purpose Joomla template to help everyone build their business website easily. This template is built with T3 Framework, Bootstrap 3 and compatible with both of Joomla 3 and Joomla 2.5. Lavida is the first multi-purpose template made by OS Solution to support our great extensions EShop Shopping Cart, Events Booking, Membership Pro and EDocman. So if you have plan to use these our extensions and consider to find a great template to work perfectly with them, then Lavida is the best choice. 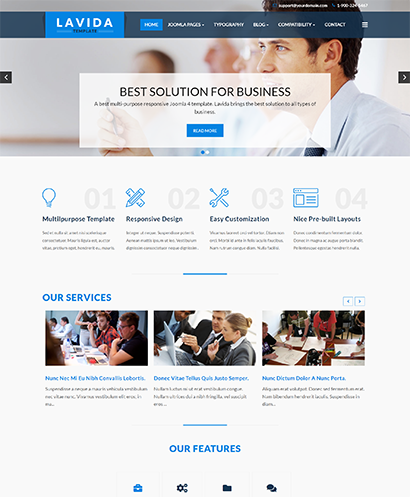 Lavida Joomla template is built with latest T3 Framework and Bootstrap 3. T3 Framework is a powerful template framework from Joomlart. With T3, you can customize the template as the way that you want easily. Lavida is a fully responsive Joomla template. It looks perfectly on diferent devices as smart phones, tablets, desktops and different web browsers as FireFox, Google Chrome, IE, Sanfari, etc. By using Lavida template, now you don't have to worry about how your site looks like on different devices and web browers! With Lavida, you can build the site as the way that you want easily by changing style, layout, colors via Theme Magic from the configuration of the template. Lavida supports both of Megamenu navigation system on the desktop and Off-Canvas menu on the mobile and tablet devices. Custom tabs with nice effect. Latest News module as a slide news. Lavida supports all the default Joomla custom pages: Login, Registration, Smart Search, Search Results, 404, Contents, Contact, etc. Lavida also suports standard style for all the default Joomla modules: Login, Search, Categories, Contents, Tags, etc. Are you interested in this our template and want to send pre-sales questions?